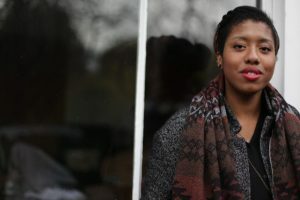 Selina Nwulu is a writer, poet and essayist of Nigerian heritage who is based in London. She has written for a number of outlets such as the Guardian, New Humanist and Red Pepper and has toured her work nationally and internationally. She has also been featured in Vogue, ES Magazine, i-D and Blavity amongst others. She was Young Poet Laureate for London 2015-6, a prestigious award that recognizes talent and potential in the capital. Her first chapbook collection, The Secrets I Let Slip, was published in 2015 by Burning Eye Books and is a Poetry Book Society recommendation. From 2017- 2018, she was ‘Writer and Creator in Residence’ at the Free Word centre and Wellcome Trust, looking creatively at food and how it connects to our health and matters of social and environmental justice. She is currently working with Somerset House on a project around loneliness and climate change. We’re not hiring any black girls this season too much sass. bad attitude. jezebel. ink blot. too much chunk. ratchet. coming for you. too much They just don’t have the right aesthetic. too much spice. thick lip. nappy knot. ink blot. baartman bounce. suffocating you. too much. We’re following what sells. too much temptress. jungle fever bite. secret crotch creep. silent shudder. wet. too much bruise. an ink blot spoiling the clothes. too much. We’re going for a very specific look. too much choke. rage. hip jut. grit. overspill. cheap sell. spoiling the clothes. an ink blot spoiling the clothes. too much European. These girls tend to have fewer curves. Keep it Simple Keep it Straight Whip Straight Flowing Keep it Clean Uniform Pure Keep it Clear Understood Keep it Chic Keep it Current Keep it Perfect Keep it Now. Keep it. against conch, willing them to come over. the tastebud clench of a tart apple. with the blushed cheeks of a first crush. it does not know where to send. clean written out of your folklores. already wear the heartache of leaving. When we go home we go back reeking of you. she has found raw in my body. fused between the crests of my shoulders. she keeps coming back to its vibration. Each session feels like a marathon. shimmers from sinews of grief.